Tortillas—a central component of the Mexican diet—have been a source of recent uproar in Mexico. Rising tortilla prices fueled protests in Mexico City two weeks ago. Many people in Mexico earn only $5 per day, and with the price of tortillas approaching $0.45 per pound, protests were inevitable. Tortilla prices may be fueling the protests, but it's the growing demand for corn among American ethanol producers that's fueling the rise in tortilla prices. As more and more ethanol plants come online in the U.S., the number of buyers in the corn market increases, putting upward pressure on corn prices. Rising corn prices mean rising input prices for tortilla makers and rising tortilla prices for consumers. So does fueling your Honda Accord with ethanol-laced gasoline take tortillas off the plates of Mexicans? The answer depends on the time horizon: the short run or the long run. Three characteristics in the market for corn make it highly competitive. 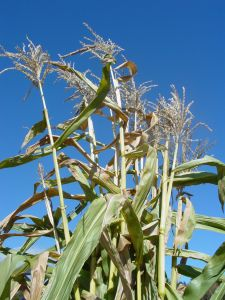 First, there are many corn producers in the United States, Mexico, and the rest of the world. Second, corn tastes about the same no matter which farmer sells you the corn. Third, there are few barriers to new corn producers entering the market in the long run. In the short run, however, firms cannot exit or enter the market. Rising ethanol production in the U.S. creates a higher demand for corn. 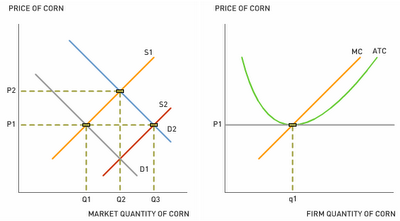 The market demand for corn shifts to the right from D1 to D2, increasing the price of corn from P1 to P2. Corn producers react to the higher price by producing more corn (moving from q1 to q2). The higher demand for corn also causes corn producers to earn an economic profit. How does this affect the tortilla market in Mexico? Corn is a major input for tortillas—as corn prices rise, the cost of tortilla production rises. The supply of tortillas shifts to the left from S* to S**. The price of tortillas increases and the quantity of tortillas consumed decreases. 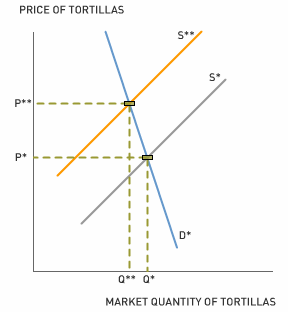 The reduction in tortilla supply causes the price of tortillas to rise sharply in Mexico because tortillas are essential to the Mexican diet (the demand for tortillas is fairly inelastic). As a result, the financial burden of higher corn prices falls on tortilla consumers more so than the producers. Fortunately, as the Los Angeles Times reports, help is on the way for the people of Mexico. In the long run, firms may exit or enter the market. Unusually high short-run profits in the corn market will undoubtedly cause more farmers to plant corn in the long run. As they do, the supply of corn will shift to the right from S1 to S2. 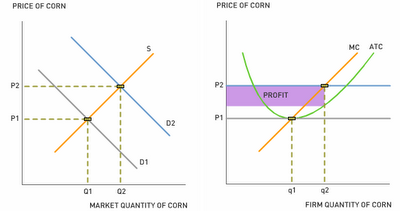 As more farmers plant corn in the long run, profits return to normal and the price of corn falls. In the long run, as the diagrams suggest, it's possible that the higher demand for ethanol will have no effect on corn and tortilla prices. Click here for another Aplia perspective on food prices and ethanol. 1. How would a price ceiling at P* affect the Mexican tortilla market? 2. Should the Mexican government subsidize tortilla producers until corn prices fall back to previous levels? How would a subsidy—or voucher—for tortilla consumers affect the tortilla market in the short-run? 3. Are Mexicans worse off or better off due to the increase in U.S. ethanol production?